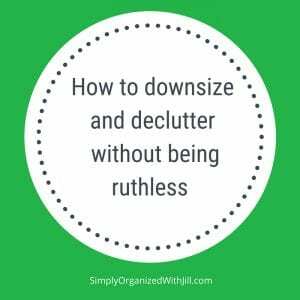 As a professional organizer, I’ve often used the expression “be ruthless.” My clients and those who follow me are urged to be ruthless while decluttering and making decisions about stuff. After discovering the true definition of ruthless is uncaring, cruel, and cold-blooded, I’m now hesitant to use it. Let’s focus on a kinder expression while eliminating excess. Here are four suggestions. You are capable of making a decision you can be at peace with. Don’t doubt or second-guess your choices. Explore your fear when you discover you’re hanging onto things because you think you may need them in the future. The future is unpredictable making it tough to be certain. Envision a future without the burden of excess stuff. Listen to your gut and the voice in your head. Are you keeping things you feel negatively about? Work hard to choose things that give off positive vibes. Banish the items that fill you with guilt or conjure up bad memories. Your excess doesn’t necessarily need to be tossed in the trash. Donate or sell usable items and recycle as much as possible. Shred or burn papers you no longer need to protect your privacy. Communities hold free shredding events in the spring and fall. Visit my website, www.simplyorganizedwithjill.com, for a link to upcoming events. Check clothing pockets before donating. I’m hoping you find money like many clients have. Closely examine papers and look inside envelopes. Some papers are important and should be filed. Envelopes might be holding checks, money or gift cards. Are you ready to replace ruthless decluttering with confident decision making?